Hanoi (VNA) – A string of new activities are expected to take place within the framework of the 16th Vietnam Poetry Day, scheduled to start on February 27 (the 12th of the first lunar month), in the hope of attracting more audiences. In the previous years, the even kicked off in the 15th day of the first lunar month and art performances honouring Vietnam’s poetry organised on the previous night. However, this year’s event, themed “Literature accompanying the nation”, will take place over four days, from February 27 to March 2. Vice Chairman of the Vietnam Writers’ Association Nguyen Tri Huan said the association issued 1,500 more invitations to members of poetry clubs compared to previous years to increase the presence of audience at the event. Four members from Japan’s poets association have been invited to exchange with Vietnamese poetry lovers on the occasion. A photo exhibition on Vietnamese writers who participated in the General Offensive and Uprising in the Spring of 1968 will be held on the margin of the event. Poetry recitation contests and art performances will take place on March 1 at Van Mieu – Quoc Tu Giam (Temple of Literature). 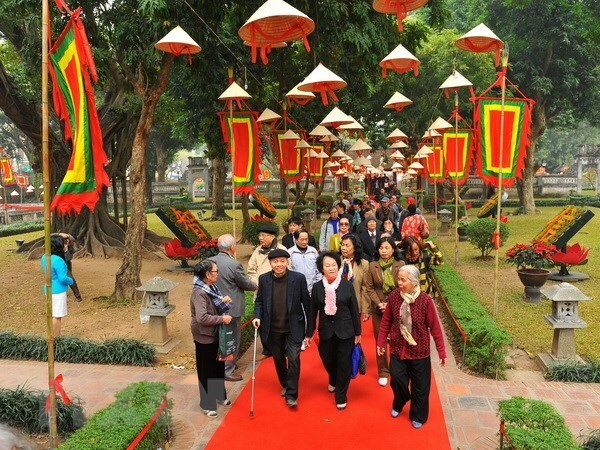 The 16th Vietnam Poetry Day will officially kick off on March 2, the 15th day of the first lunar month, at Van Mieu – Quoc Tu Giam. The organising board is also looking to gradually turning the Poetry Day into a festival for literature in general. Towards this goal, besides a workshop featuring Vietnam’s current poetic issues on February 27, a discussion on fiction reform will be held on February 28.